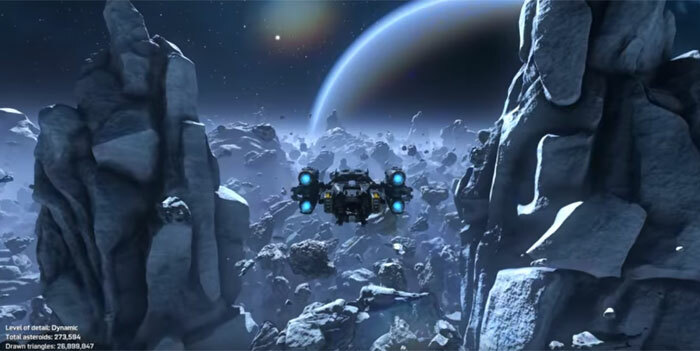 Nvidia has released an application called the Asteroids Mesh Shaders Demo. It isn't a GeForce 20XX revamp of the iconic Atari game but a technical demo showing off Turing Mesh Shaders. If you have a Turing GPU powered graphics card in your PC you can download and run through the demo yourself, steering the spaceship through the asteroid belt, and moving the camera angles – and can adjust various options and settings. If you don't have a Turing GPU available I think it is still worth a watch of the YouTube video Nvidia has shared, embedded below. The key take away from the demo, and accompanying developer blog post, is that Turing introduces a new programmable geometric shading pipeline built on task and mesh shaders, and this can "dramatically improve performance and image quality when rendering a substantial number of very complex objects in a scene". We have heard of similar techniques before but, in brief, the advantages of the compute programming model can be brought to the graphics pipeline – to provide greater programmability. This allows for "advanced culling techniques, level-of-detail, or even completely procedural topology generation," explains Nvidia. There are more thorough and technical Turing Mesh Shaders posts available than the asteroids demo blog provides, if you wish to delve deeper, or even deeper. First the task shader checks the entire asteroid for visibility and determines which LOD(s) to use. Sub-parts, or meshlets are then tested by the mesh shader. Finally, the remaining triangles are culled by the GPU hardware. Nvidia notes that Tessellation is not used at all in this demo and all objects, including the millions of particles, are taking advantage of Turing Mesh Shading. Big news for future consoles maybe, and if the likes of this and DLSS is where next gen goes, then the 20 series cards are looking like a better buy every day, they are starting to seem quite future proofed if you don't focus on ray tracing (although I hear Metro and Resident Evil 2 perform great with their DXR implementations so that might even be great too yet, waiting to see that with my eyes of course, I mean BFV is pretty but not enough to warrant investment yet even though I already have haha). I think a lot of the success of these new NVidia technologies all rest on who has the contracts for the next lot of consoles and what can and can't be implemented within those games. So, in simple terms, it's distance-dependent reverse-tessellation which despite obvious optimization requires a jump in hardware far beyond regular tessellation ever really required? Any chance of including a download link in the article please? Like Ray Tracing, impressive tech. ..But just not worth the money they're asking for it. After LOD 5 is kind of overkill, you can easily still get great result with well designed textures and you save A LOT of triangles.